One of my favorite things to make is freezer jam. One, it’s so simple and two, it’s SO SIMPLE. 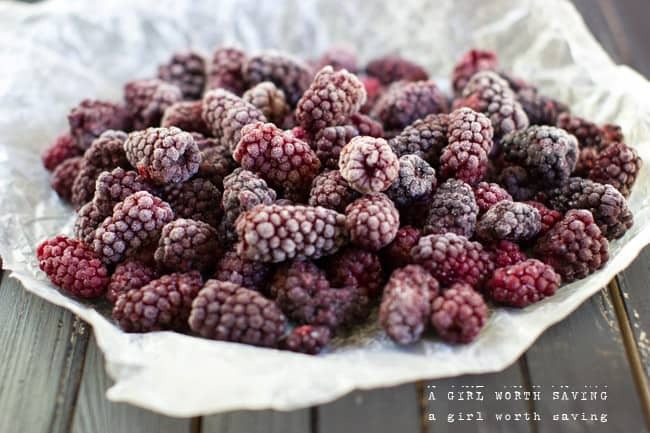 You can even use frozen berries to make a new batch of jam when you run out. Let the mixture cook at a low boil for roughly 45 minutes or until the mixture is reduced by half. Leave your pan on the stove and then mix in the gelatin. Mix for 1 minute and then pour into your mason jar. Let cool and either seal the jar up with a lid and store in your freezer or in your fridge . Once opened it is good for one week. The biscuit is my Paleo sweet potato biscuit recipe. I did make two changes. I used cashews instead of walnuts and I used white sweet potatoes versus garnet. 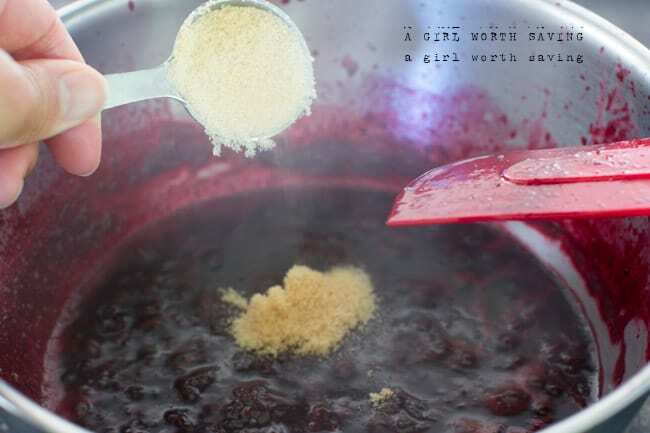 Combine the blackberries, sea salt, vanilla and honey in a medium pan and bring to a boil. Reduce the heat to medium boil and let cook for roughly 45 minutes, until the mixture is reduced by half. Turn off the heat but leave the pan on the stove. Add the gelatin and mix for one minute. 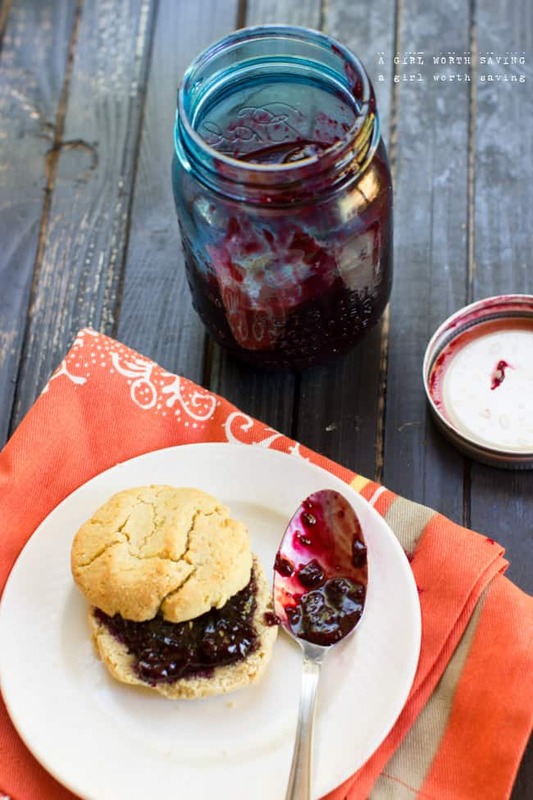 Pour the jam into your canning jar and cap with a lid. This makes about 1 1/4 cups of jam. let cool and then store in your freezer. Once opened the jam lasts for one week. Paleo Meal Planning? How many hours do you spend cooking? I like that there is very little honey in this recipe. 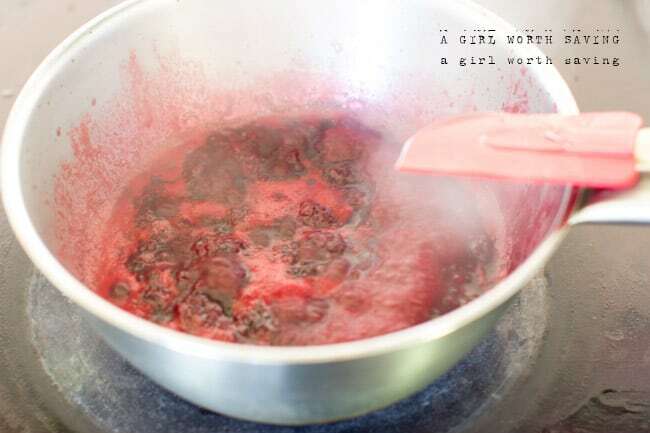 So many jams are far too sweet for me and end up making me sick. 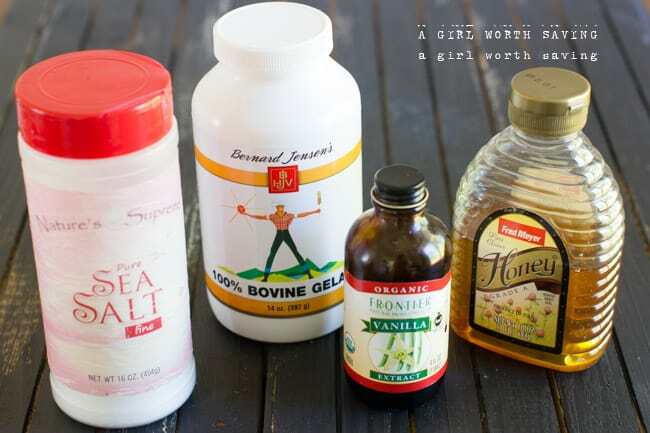 I’ll try this but I’m a little afraid of the bovine gelatin. Yes! 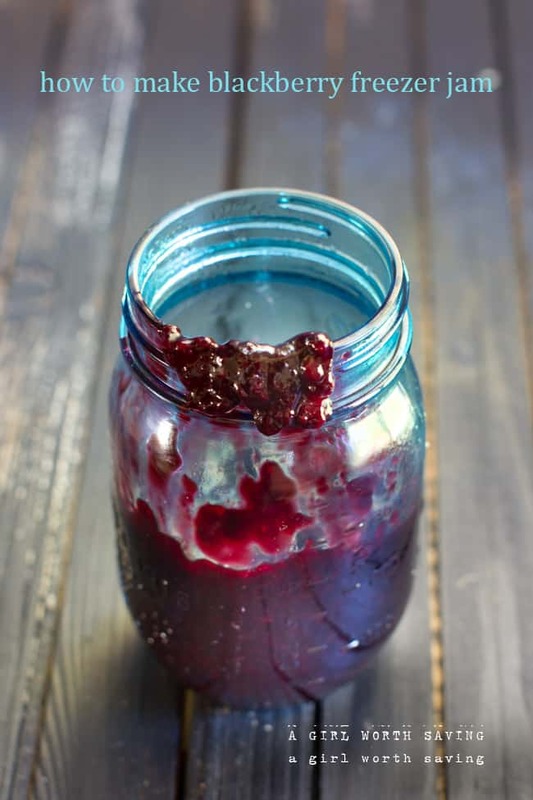 I was looking for a low sugar preserve or jam recipe and I love this! Don’t be afraid of gelatin, it’s super easy to work with and you can even correct constancy after its set. I use gelatin pretty often to make homemade “jello”. It’s good for your nails and bones. And it’s flavorless, it can go in anything! Girl, that looks great! Putting it on biscuits puts it over the top. Yum! This is so simple and bet it tastes amazing! This looks delicious! I love blackberries! This doesn’t look too hard. I’m definitely going to try this. Thanks for the great idea and the biscuits look so good. My dad was diagnosed with adult onset diabetes a couple of years ago and has cut out all sugar. Would this work for him with his diabetes? 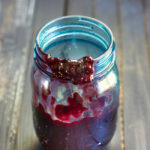 He loves blackberry jam and we have dewberries (a variety of blackberries) on our ranch and have several bags in my freezer. 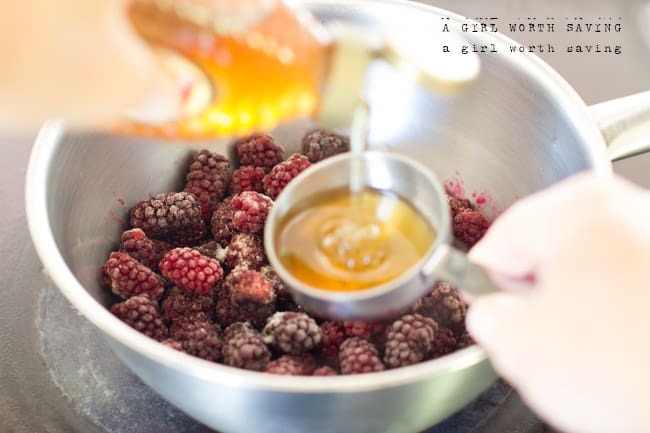 You could easily replace the honey with stevia or, if your berries are sweet enough, skip the sugar altogether. I’m so glad that you enjoyed it Cassandra! Instead of using frozen berries could I use fresh berries off the blackberry bushes? I have a boatload of blackberry bushes in my treeline and would rather use them. Yes, that would work hun! Would fresh strawberries work too? This sounds amazing! Must try 1st. Btw. I looked to find your gelatin and it can be found on Amazon.com. For those that need to know the product info does indicate that the cattle feed on grain and grass so not 100% grass fed nor neccesarily non gmo since cattle are from Argentina where much gmo grain is grown. Yes, I just found this out Laurie which is now I recommend this brand http://bit.ly/1tvGgHa. I hope you enjoy it! Working on this recipe right now! Smells amazing. When I added the gelatin, it all chunked up. I have put it in my vitamix to try to dissolve. Did I do something wrong? Using Great Lakes gelatin. Did you add it when the ingredients were warm? I’ve noticed if it hot when I put it in, it will chunk up. Yes, David I would recommend doing that.